HIGH POINT, N.C. - Residential furniture orders rose 8 percent in November compared to the year prior, and 1 percent higher than October orders, according to the latest Furniture Insights survey of residential furniture manufacturers and distributors from Smith Leonard. New orders were up in November for 61 percent of the surveyed participants, compared to 52 percent which recorded an increase the month prior. Year-to-date orders were up 3 percent compared to 2015. 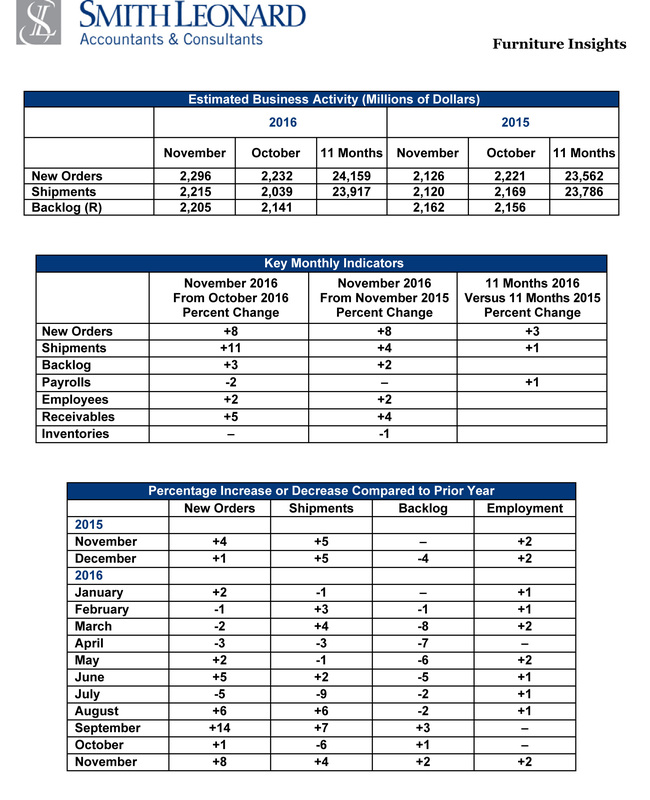 In line with current conditions, receivables were up 4 percent in November compared to 2015, and 5 percent higher than in October. Inventory levels were flat coming out of October, and dropped 1 percent compared to a year ago. Retail furniture sales have been up slightly from November, noted Ken Smith, managing partner at Smith Leonard. And despite mixed results from consumer confidence surveys, "Most of the other key factors for selling furniture are still positive," Smith said. "Even with the stock market slight pull back, overall, it is still strong. And from what we are hearing, while business can always be better, it seems to be doing fairly well. Though based on our survey, that is not true for everyone."